On January 8, 1821, the Creek Nation Indians ceded a large tract of land to the white man that included the present Hapeville area. In 1853 that land was incorporated into Fulton County. Hapeville grew out of individual farm settlements owned by the Thrailkill, Cash, Mangum, Sims and Hape families. In 1871, Dr. Samuel Hape and other investors purchased 500 acres of wooded land on the Macon and Western Central Georgia Railroad, eight miles south of Atlanta. 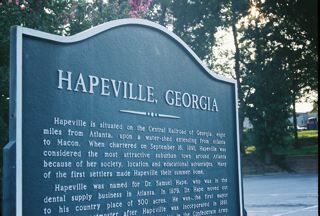 The Village of Hapeville was chartered on September 16, 1891 by Dr. Samuel Hape, Hapeville’s first Mayor. Dr. Hape was a native of Middlebury, Maryland who came to Atlanta prior to the Civil War. The most significant impact on Hapeville’s future occurred when Asa G. Candler, Jr. allowed the center of his oval race track to be used as a landing field for aircraft. The City of Atlanta purchased this area in 1929 and founded its municipal airport, which eventually became the world’s busiest known as Hartsfield-Jackson International Airport. Hapeville is also home to Delta Air Lines, Inc. Corporate Headquarters. The December 1947 opening of the Ford Assembly Plant marked another major impact on Hapeville’s economy as did the 1960 opening of the Airport Hilton, linking Hapeville to the international chain of hotels. Source: Milton, Edwin, et al. A History of Hapeville. WH Wolfe Associates: Alpharetta, 1991.